To get better at your craft, there’s nothing more valuable as learning first-hand from the experience of others. What little tricks have helped fellow designers, design leaders, and developers become more efficient? And how do they overcome hurdles in their projects? Conferences are a brilliant opportunity to get up close with the pros and exchange tips and ideas. But they aren’t the only one. To spread expert knowledge between people who are hundreds, even thousands of miles apart, our friends at the full-stack UX design platform UXPin brought the first free virtual summit to life a few months ago. Now the second edition is on its way, and we are very happy to help make it happen: the Agile UX Virtual Summit, focusing on all things Agile UX. Because, well, we all know that building a UX team with agile organization can be quite a challenge. To spread expert knowledge between people who are hundreds, even thousands of miles apart, our friends at the full-stack UX design platform UXPin brought the first free virtual summit to life a few months ago. Now the second edition is on its way, and we are very happy to help make it happen: the Agile UX Virtual Summit, focusing on all things Agile UX. Because, well, we all know that building a UX team with agile organization can be quite a challenge. What’s The Virtual Summit About? Four days, 16 live webinars, 32,000+ registrants. 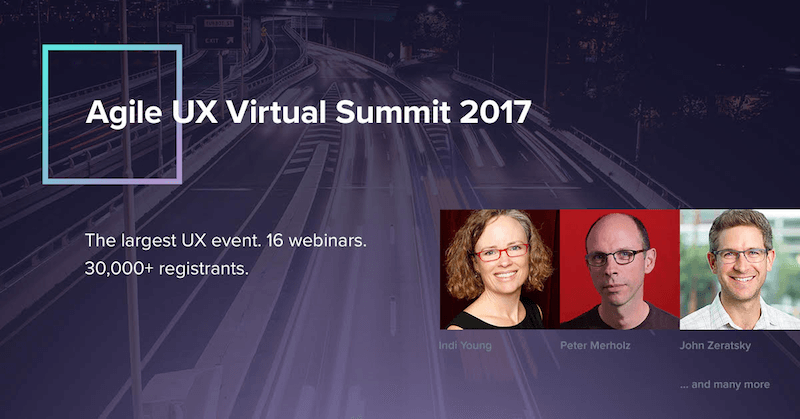 That’s the Agile UX Virtual Summit 2017 which UXPin will host from June 13th to 16th. Throughout the four days, UX experts will share their tips and best practices on how you can make Agile UX happen in your organization. No fluff or theory, only immediately applicable techniques. The free Agile UX Virtual Summit shares tips and best practices to make agile UX happen — for good. The event will dive deep into the reality of product development today, with 17 renowned speakers (from Google, Fjord, IBM, and Bloomberg, among others) providing valuable insights. To give you the most practical learning experience and take your Agile UX workflow to the next level, they’ll dissect recent case studies and projects they worked on. Conducting user research, holding design sprints, implementing participatory design and developing a product strategy are only a few of the topics that will be tackled along the way. Sounds good? Well, you can join the event for free from anywhere. The webinars will take place from 9:00 AM to 3:00 PM (PDT) each of the four days (see the schedule below for more details), and a virtual lobby in Slack will provide an opportunity to connect with thousands of UX and product folks from across the globe — right from your office desk. Four days dedicated to giving your Agile UX skills some tailwind. If your schedule doesn’t allow you to make time for all of them, you can cherry-pick those webinars you’re most interested in, too, of course. Recordings will be sent to all registrants. All times are PDT. How Do You Join The Event? You can register for the live event directly on the Virtual Summit site. It’s free, no strings attached. Enjoy!